Trying to finding the perfect hair product can be difficult. Look no further. B. 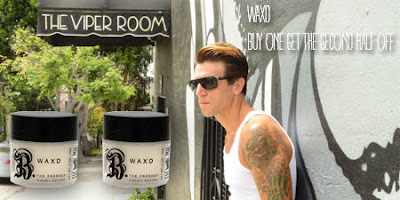 The Product's Waxd is a Soy based hair wax that will give maximum hold to the most limp and lifeless hair. Made from Soy, Waxd won't cause your skin to breakout even while you sweat. Great for all hair types, use the Waxd to slick, spike and groom your most important accessory. Right now at B. The Product.com, purchase one Waxd, get a second for half off. Add first Waxd to your cart, a second will be offered for $12.50.